The CSB Day-by-Day Chronological Bible features a clear narrative approach to the Bible, arranging the complete text into a fresh chronological reading plan with daily readings guided by Dr. George Guthrie. Unlike other chronological Bibles, this arrangement is not date specific (e.g. "January 1"), so the reading plan can begin at any point in the calendar year. Scripture presented in three main acts (God's Plan for All People; God's Covenant People; God's New Covenant People) and seventeen total scenes, an introduction for each act and scene to orient the reader to its importance in the grand story. Real life is messy. The CSB (in)courage Devotional Bible helps you find God in the midst of it. As you study God’s Word, 122 women from the (in)courage community come alongside you with 312 devotions, sharing stories of how God’s story has changed their lives. Because of His grace, they have found beauty in the brokenness and hope in the hard. With each devotion, they sing the praise of the One who has authored their story. 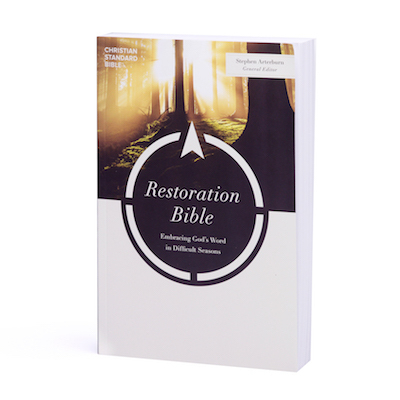 Download a free sampler, find a reading plan, watch videos, or order your copy today at incouragebible.com.